This is probably one panel of a multi-panel composition. 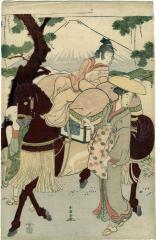 Perhaps it represents part of a daimyō's procession or a mitate of one or of Ariwara no Narihira's expulsion from the capital in the 10th century. Notice the male footman barely visible on the other side of the horse near its head. There are at least two other prints in the Lyon Collection which use Fuji as a backdrop. See the links above.